Cuba has long been a dive destination lurking in the background, but is now emerging as a new superstar in the world of scuba spots. Years of political isolation and habitat protection mean that divers are suddenly now discovering a new underwater treasure. 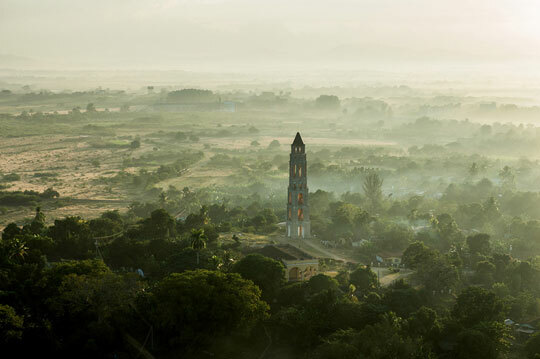 The undeniable jewel in Cuba’s crown is the area known as Jardines de la Reina. 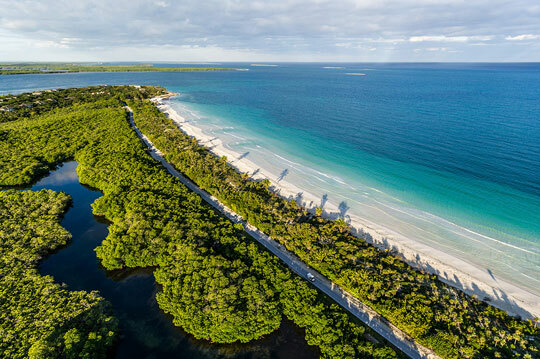 This chain of islands that runs along the west coast of the mainland is home to a number of world-class dive sites and is Cuba’s top liveaboard safari destination. Sharks are the No.1 drawcard here. It is possible to encounter up to 6 distinct species on a sole dive. 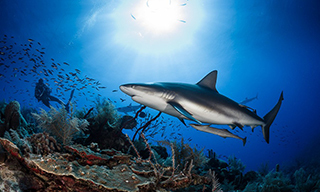 You can expect to see species like silky, tawny nurse, and most of all Caribbean reef sharks. But you might be lucky and also spot lemon, great hammerheads and bull sharks. Whale sharks can even put in an appearance from July through November. However, sharks are not the only interesting sight to see. There are many different fish species here. 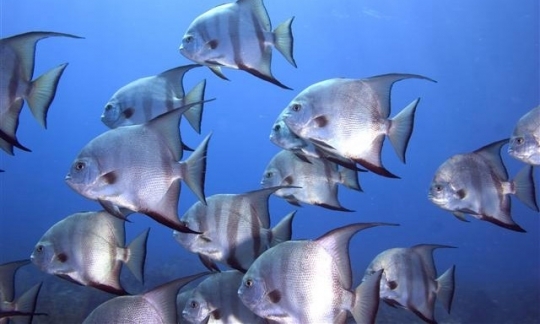 In fact it is said that the Queen’s Gardens is home to one of the most diverse and largest fish populations in the Caribbean. 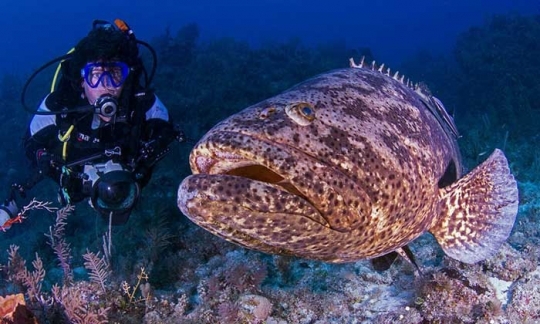 There are groupers galore, including goliath groupers which can be huge and meaty specimens. 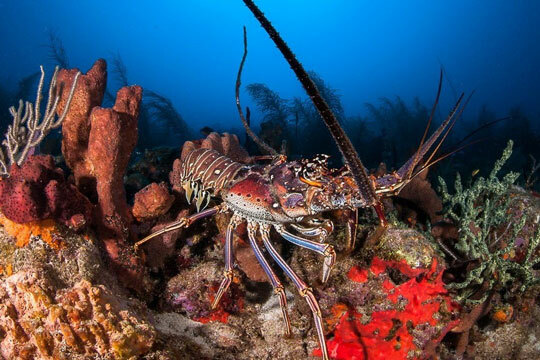 There are also many crustaceans, including Caribbean spiny lobsters and yellowline arrow crabs. Big schools of jacks and grunts, great barracuda and tarpon, sea turtles and rays will all be vying for your attention at these amazing dive sites. 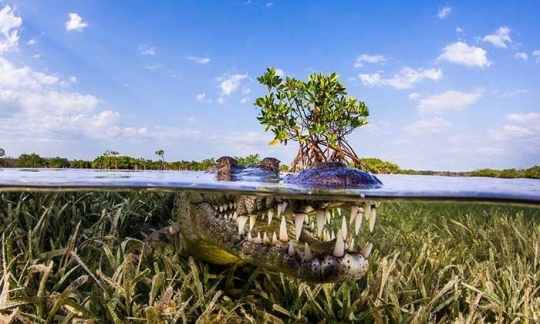 And it's highly likely you will spot a caiman or two in the mangroves from the safety of your Cuban liveaboard boat or even dive with them on request. Jardines de la Reina - This is undoubtedly the number 1 dive spot in Cuba. Commercial fishing and other deleterious industries have long been prohibited and there are no permanent residential structures. Tourism numbers are also strictly controlled. So this huge marine reserve of some 840 miles² (2,170 km²) now teems with life and is impressive in terms of both biomass and diversity. 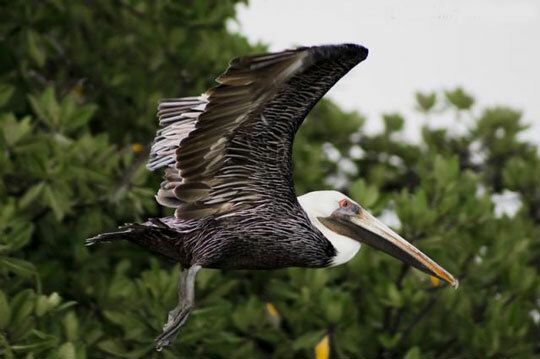 Life-supporting habitats in the Queens Gardens range from mangroves to sea grass beds, mud flats, beaches and reefs. 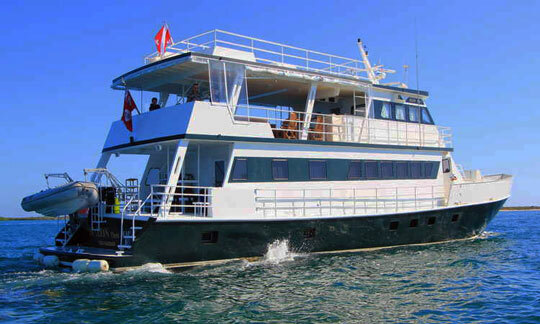 Dive sites include reef flats, walls and wreck dives. There is an impressive array of corals here too. You can expect to see bushy black coral, grooved brain coral, smooth flower coral and sea rods. Sponges are also present in impressive varieties including branching tube, stove-pipe, and stinker sponges. [More details on these dive sites: Cuba]. 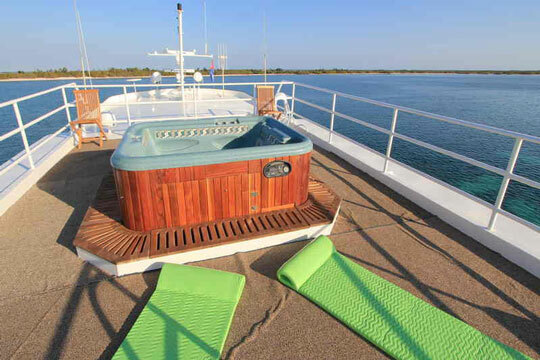 The liveaboard experience in Jardines de la Reina is a little different to other destinations. Here the boats do not travel great distances and may indeed be the equivalent of a floating hotel. 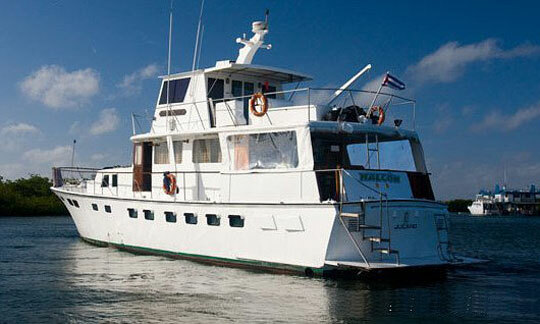 This is the case with the liveaboard Tortuga. Being stationary, Tortuga enjoys a good internet connection which can be used by guests of the other liveaboards like Halcon and Avalon I, which tend to be nearby. 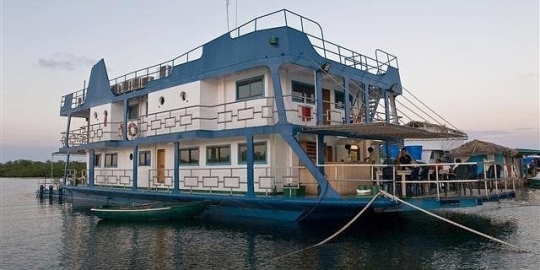 Tanks are filled at the diving center and transported to these liveaboards. 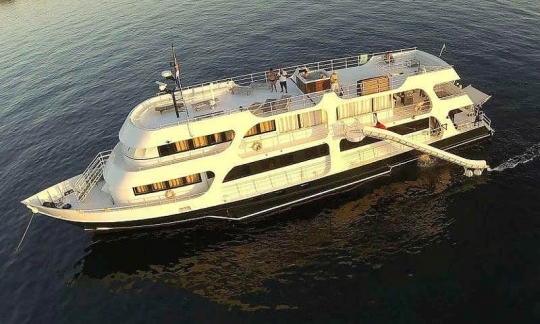 Avalon II alone has its own compressors on board and therefore enjoys a more expansive itinerary than other members of the fleet. 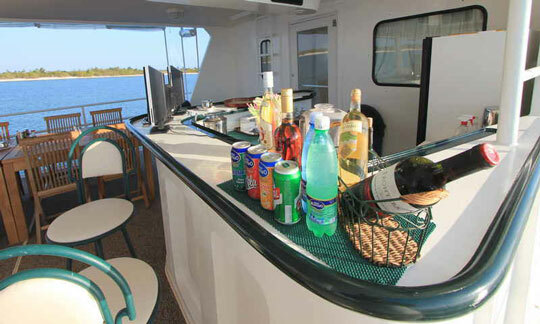 All trips are scheduled for 6 nights and depart every Saturday. 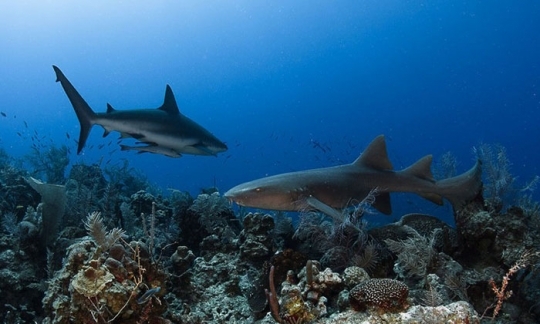 You can dive Cuba's Jardines de la Reina throughout the year. 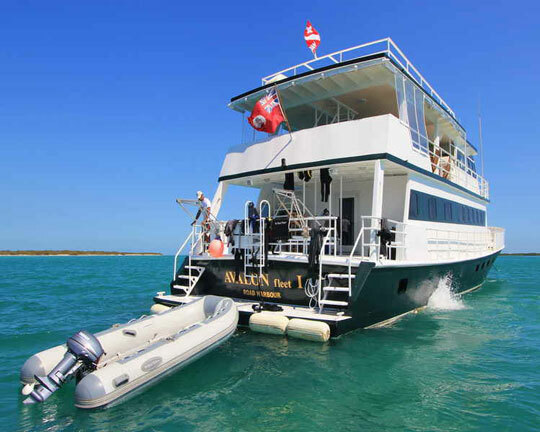 The liveaboard boats depart every week all year long. December through April is the dry season with water temperatures (and land temperatures) of around 68 to 72°F (20-22°C). August is the peak summer month where temperatures can climb to as much as 83°F (28°C). June through November carries a slightly higher risk of hurricanes although Cuba experiences considerably less of these than other parts of the Caribbean. These months do have higher rainfall. July through November brings the opportunity of whale shark encounters. International flghts arrive into Havana's international Airport where you will be met and transferred to the boat. This involves a 5 to 6 hour bus transfer and a 3 hour boat transfer. Direct standard flights arrive in Cuba from cities like Toronto (Air Canada ), Mexico City (AeroMexico ), Bogota (Avianca), Cancun (Interjet), Moscow (Aeroflot) and London (Virgin Atlantic). Connecting flights are possible with airlines such as Qatar Airways, Air Europa, Air China, Emirate, Air France, KLM and Cathay Pacific. Charter flights are available from New York (Jetblue and Sun Country Airlines), from Baltimore (Island travel & Tours), and from Tampa and Fort Lauderdale (ABC Charters and Jetblue). There are around 20 countries that have a visa-free arrangement for citizens to visit Cuba. However, these tend to be rather small and obscure nations. Citizens of most countries need to obtain a tourist card from a Cuban travel agency, authorized airline, or diplomatic mission. The tourist card is for 30 days (90 days for Canadians) and can be extended once for a further 90 days. You may also be asked to provide proof of return flight, booked accommodation and travel insurance. In addition to obtaining a tourist card, all U.S. citizens and residents (regardless of their nationality) travelling to Cuba need to comply with the Treasury Office of Foreign Assets Control (OFAC) regulations. Requirements change quite frequently so you must ensure you have the current information before making your booking. For more information see the U.S Department of State, Bureau of Consular Affairs website or contact your nearest Cuban embassy or overseas representative . 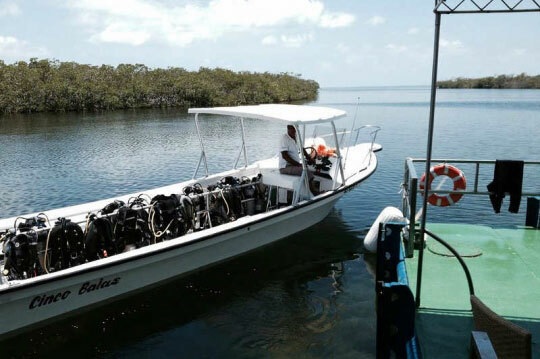 U.S. citizens and residents booked on a Dive The World Cuba diving cruise need to obtain the required documentation confirming that the cruise itinerary meets the OFAC requirements. Only American companies can provide this documentation, such as ECO Cuba Outings for this purpose. Once you have confirmed your booking, you can contact them to receive your authorization letter (approximately US$ 100 per person). 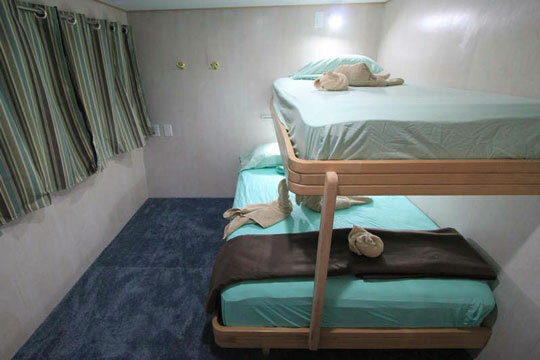 The liveaboard cruises we recommend meet the requirements set out by the OFAC. If you need a hotel stay before or after visiting Cuba on your diving safari then check out the Cuba Travel Network website . They have many accommodation options, and also have car rentals and other vacation services, should you need them. You can pay securely online with most major credit cards. Cuba does not require visitors to have had specific vaccinations, although tetanus, typhoid and hepatitis A are often recommended. There are occasional outbreaks of dengue fever, spread by mosquitoes. Cuba is not a malarial zone. It can be hot and humid so wear light clothing and try to keep yourself clean and dry (except when diving). You should seek independent medical advice before traveling to Cuba. 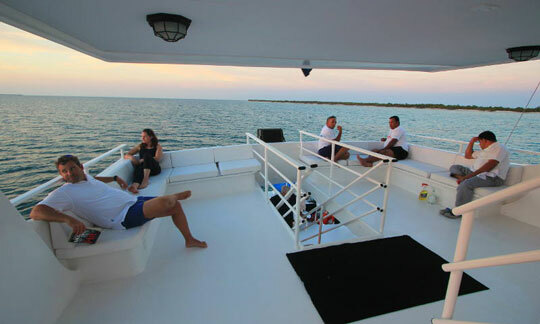 Most people complete their diving trip without any significant health problems to spoil their enjoyment of their vacation, in this exciting and vibrant destination. Tap water is not safe to drink in Cuba. Drink bottled or boiled water and avoid ice. 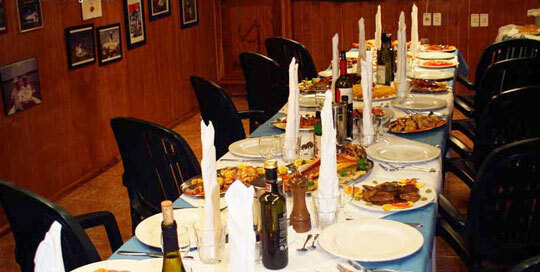 The usual, common-sense precautions against food poisoning should be followed. Most Cuban cities have health clinics specifically for tourists and health insurance is required, so you can also purchase some on arrival. The crime rate is low in Cuba. It is considered one of the safest destinations in Latin America. So you are much more likely to come away praising the friendliness and helpfulness of the locals, than complaining about any crime. Cuba is also very well policed. Petty, opportunistic crimes like pick-pocketing and bag-snatching are rare but do happen. Poverty rates are high so this is to be expected. Limiting your chances of falling prey to such behavior includes keeping flashy jewellery and photography equipment to a minimum, and guarding your wallet or handbag. Little serious crime occurs in tourist areas and, especially if you are venturing further afield, take taxis after dark. Scams you may potentially be exposed to include fake cigars being sold as if they are top-of-the-range, exchanging national pesos for convertible pesos, and super-friendly people who speak English and expect you to pick up the tab for whatever they consume in your company. Beware on the roads as potholes and poor illumination can make driving tricky, so if you are hiring car or scooter (or even a bicycle) take extra care. Most people stick to using the inexpensive taxis that are everywhere. Cuba tourism conjures up images of walking through old Havana, with cigar-scented, music-filled air, as vintage cars chug past. Cuba enjoys a very rich mix of culture, from locals mixing over the generations with Africans and Europeans. This cultural diversity has resulted in the vibrant and unique Cuban architecture, music, food and handicrafts. In Havana you can sip a mojito, explore the works of local artists and musicians on Callejon de Hamel, and enjoy an architectural tour of Old Havana. There are plenty of museums and buildings of cultural significance to visit including the National Museum of Fine Arts, the Museo Hemingway Fina Vigia, the Gran Teatro de la Habana, and Havana Cathedral. Walking is a great way to see Havana. You can enjoy a shoreline stroll on the beautiful beaches of Playas de Este. Take an evening walk along the Malecon where friendly locals congregate by the sea to socialize. Enjoy an architectural and shopping experience by strolling done the Paseo del Prado. For some more ideas on activities, sightseeing and adventures here, visit the Cuba Tourism website . Cuba has one time zone, which is the same as EST (Eastern Standard Time). It is 5 hours behind GMT (UTC - Coordinated Universal Time). Electricity is supplied throughout the entire nation by an alternating current (AC) at 110 volts. The sockets are of the American 2-prong standard. It is highly recommended that you use surge protection and/or unplug electronics during a storm since your equipment may suffer surge damage. The international dialing code is +53 and telephone communications are not cheap. The best way to do it is from your hotel where you will be connected via an operator. Only since 2008 have ordinary Cubans been allowed to have mobile phones and it remains an expensive system. The Cuban authorities are deeply mistrustful of the internet and for years they tried to control access to computers and the internet and to restrict the sites that could be viewed. Now things are more open but the systems are expensive for locals. There are now internet cafes and wi-fi hotspots in public locations At the time of writing there is no broadband service in Cuba, but that is expected to change very soon. The postal service between Cuba and the U.S. restarted in 2015 after a hiatus of 52 years. However, the service out of Cuba is notoriously slow and unreliable. We recommend you send virtual postcards by email to the folks back home. As always when you visit a foreign land, it pays to know the local customs and social taboos. Local Cubanos will know you are a foreigner and will likely forgive your blunders with good grace. However, there remain certain standards of behavior which one would be well advised to follow. Things may be changing in Cuba but old habits die hard and they won’t take kindly to anyone taking photographs or videos of military or police activities. Don’t go making political comments or speaking ill of the Cuban government. You are better off not being on your own at night, particularly around Old Havana. Avoid getting involved with unofficial guides. Don’t litter, spit or even blow your nose in public! Tipping is not a Cuban tradition and is not expected, except in all-inclusive resorts. If you are going to tip, use convertible pesos, not US dollars. Discretion when tipping is important. Some guidelines suggest a single convertible peso, per action or per day, is sufficient. Politeness and gratitude can often get as good a response as a tip in Cuba. You should pack for a range of circumstances when visiting Cuba. Beachwear might be important when you are standing on the bow of a Cuba diving liveaboard, but won't work as well in Havana town. In the city it is more urban and gritty, so long pants and jeans are more appropriate. Temperatures can vary with weather changes, so don't assume it will be hot and humid all the time. Penalties are severe for anyone involved with drugs. Don’t do it and don't carry anything through customs for anyone else. Drug trafficking is a problem on the rise. Gun crime and murder rates are both very low. Old Havana is probably the edgiest place you will visit in Cuba. If you are not alone and keep your wits about you, it is very unlikely anything untoward will happen. Treat those who approach you with politeness but be wary of their intentions, which may be simply to get a few free drinks from you. Taking official taxis and using official tour guides is strongly advised. Getting short-changed is a pretty common occurrence, so always check your change before any transaction is complete and you move away. If you need to bring expensive things into the country, bring receipts for them to avoid problems at customs on departure. Have copies of all your vital documents in case of emergency. As a responsible scuba diver, you wouldn't dream of taking away anything from Cuba's long-protected coral reefs. The Cuban police are not the most corrupt force in the world but neither are they the most motivated. The speed of process in cases of crime is almost imperceptible. 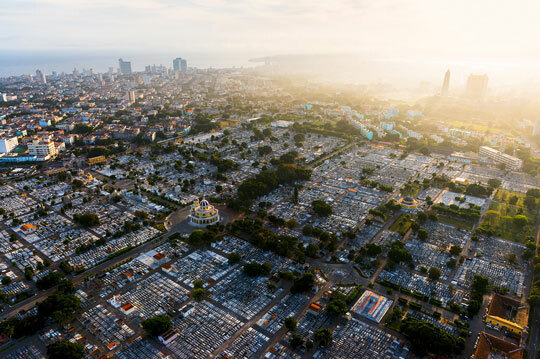 Use safety deposit boxes where available, exercise due caution, and you will leave Cuba, like the vast majority of visitors, with only fond memories.